There is a bit of truth in this.. . Wallpaper and background images in the Arthur und Gwen club tagged: arthur bbc bradley james merlin. This Arthur und Gwen photo might contain zeichen, plakat, text, tafel, schilder, and poster. I hate to admit it but there is a lot of truth in this confession. Arthur has not saved the day one time on Merlin. The magic reveal really is going to be a crushing blow to Arthur. He has always sought to prove that he should be king, how is going to feel when he finds out that all of his big victories are due to Merlin. Not some of them but ALL OF THEM! My hope is that the PTB, allow Arthur some wins before he finds out Merlin's secret. Hell even in the damn interview it becomes clear that this is also Bradley's fondest wish. He went about it politically correctly but it is VERY clear he is over the baffoonery, drop trou, childish aspect of this relationship. He wants Arthur, justifiably to come into his own for the final season. I firmly agree. It is about damn time for the Once and Future King to become. I hate to say this but I agree...I love Merlin and the relationship between him and Arthur but c'mon I get that the show is called Merlin but Arthur is the once and future king can he have some credit for that? At least for the sword in the stone scene...they could have made a spell that only a true hearted leader could break,a real king. In this way both Arthur and Merlin would have credit for that...but not just Merlin! Not at all! I totally agree with you. No. You were not harsh. I actually thoroughly dislike this scene. This is the one aspect of the legend I did not countenance them messing with. It defeats the purpose and actually hampers the ethos that is Arthur. For those clueless about the core of the legend it makes no difference, but for those with an ever so slightly more informed perspective, this sucked big time! I got used to Merlin always saving the day, although that is not how it should be. Arthur is the Once and Future King for god's sake! He is more than able to manage things on his own! But this scene, the Excalibur scene, was totally messed up! This was Arthur's moment and his alone! I hated the whole darn thing INCLUDING the set up. It was horrible. To be honest, I forgot about this scene, until a few weeks ago. That's just how sad this bit of no sense was. And I thought that I was the only one who felt this way! Merlin's been saving Arthur's life and feeding hime his lines from behind the curtains, in a matter of speaking, since the pilot episode, and this has continued for 4 years now! The only time that I can remember Arthur having both his and Merlin's life in his own hands, was when he suggested smothering guyer berries all over their faces, and even that was a leap of faith, not certainty. AGREE, AGREE, all the way with all you have said here!!! Merlin's the protagonist on this show, yes, but it should not be at the expense of who the once and future king is. This is one aspect of the legend they should not have tampered with to the extent that they have. I did not like that scene AT ALL. For me, it was stripped of all its glory. How they are going to get out of the hole they have dug for the Arthur and Merlin relationship is beyond me. I am sorry to say that the problem once again lies at the feet of the writers. @headinclouds: This is the best suggestion I've heard yet. I agree with the confession and all that has been said here. I'm really tired of Merlin always having to save Arthur and how Arthur's accomplishments are always actually Merlin's. The sword in the stone scene should have been Arthur's shining moment but they had to take that away from him and give it to Merlin once again. I'm really tired of how Merlin always lies to Arthur and manipulates him even when he doesn't have to. The lying has now gone far beyond keeping his magic a secret and the need for self preservation. Like did he and Gaius have to lie about Morgana's invovlement in Uther's death? Or the fact that they knew were Morgana's hut was? Or that Lancelot was a shade? They treat Arthur like a child who can't think for himself or handle things on his own and that has to stop. If Arthur is destined to be the greatest king that the world has ever known, then it's time that he started showing the intelligence and maturity needed to fulfill that destiny. Yup. I have nothing more to add. How can i top all that's been said above? i agree with the confession full heartedly. For me, two things define the epicness of Arthur; the sword in the stone and excalibur (in the legend both swords were different). But in the series they merged it into one sword. Fine with me. Yet they screw up both scenes. The lake scene had Merlin retrieving the sword and the stone scene had Merlin helping Arthur to retrieve the sword. Big time screw up, i must say!! If these two scenes are totally screwed up on Merlin, there's nothing else left in store to prove Arthur as the majestic king we all know he is! Shame on you writers ... i thought season 4 was Arthur/Bradley's to own yet, the pivotal scenes are wasted just to ensure Merlin gets some decent scenes as well. They could have given Merlin a battle scene with Morgana to give him a moment to shine, why use Arthur's? Like all said, Arthur didnt get to do one thing right on his own, gets treated like a child and has to depend on Merlin to decide upon anything. I always believe things happen for a reason so i'm going to allow myself to be optimistic here. Though i hate what i saw, i'm going to hope perhaps the writers have planned big for us in Season 5. Darker, more elaborative storyline perhaps, distinctive twist maybe ... let's wait and see what they do have for us. On further reflection, a lot of the things that Merlin helps with are magical elements beyond Arthur's abilities. That being said, he still should have been allowed to pull the bloody sword from the bloody stone without Merlin's help. Come on. I agree with this confession!! The writers have really messed with sometihng they shouldn't have! Yes! Yes! Yes! I agree with all that has been said. Arthur is treated like a child, he know very little of what is actually happening. How many times has Merlin saved Arthur's life? Arthur has grown so much and it's time to show that he is his own man! This moment was supposed to be Arthur's moment, but they just messed this up. 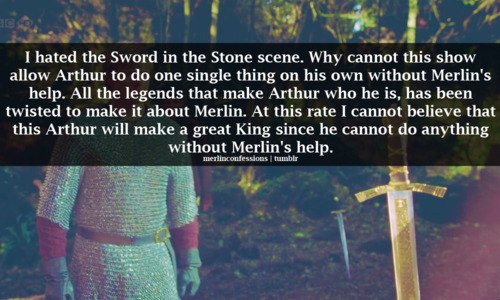 This was to show Arthur that he was capable of ruling a kingdom and Merlin shouldn't have helped him, at least in that. It's ok for Merlin to save Arthur's life and help him sometimes, but sometimes! I just want to see Arthur, the king of the legend, the best king Camelot has ever known! C'mon just give him a little credit, please!